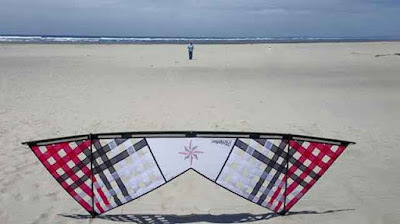 I know everyone isn't into kites ... but hand made kites from the Gold Coast of Australia are another story indeed!! 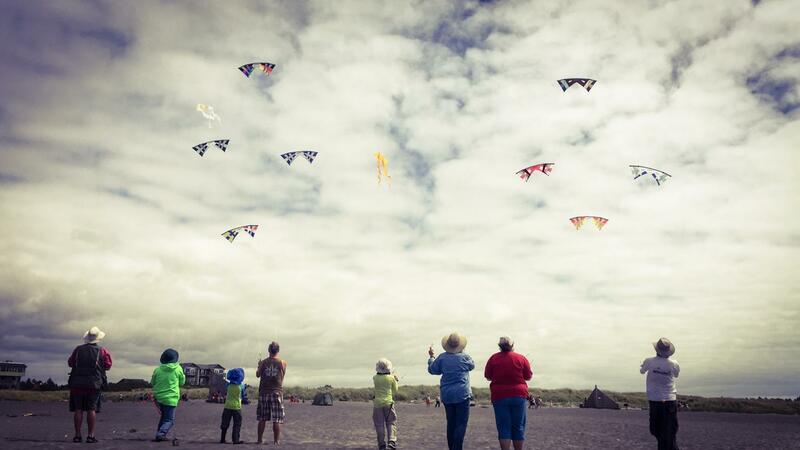 As far as Revolution kites are concerned, there are three big names. John Barresi, 25 time World Champ, Eliot Shook, artist, designer, kite maker and Barry (Bazzer) Poulter, artist, designer and kite maker. 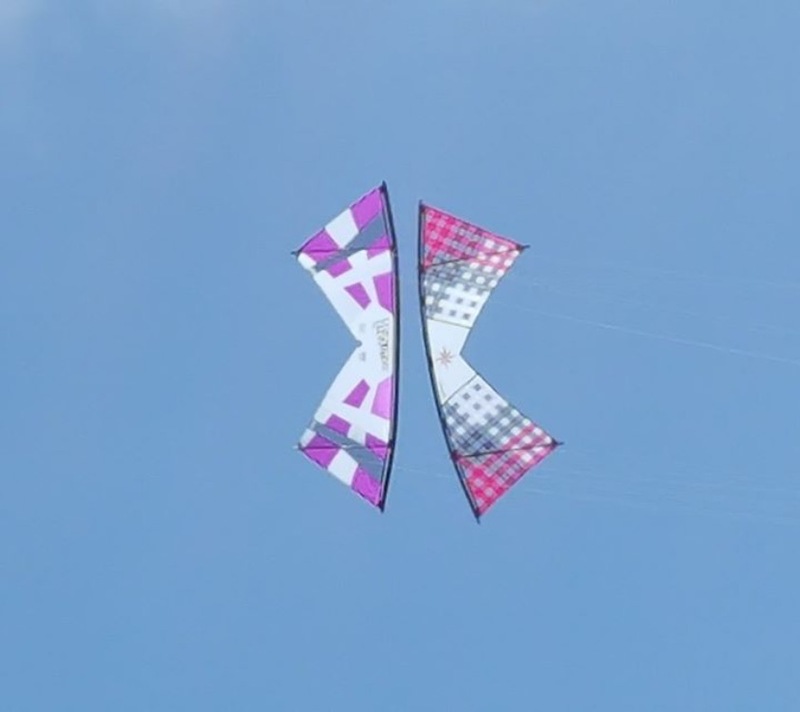 These guys have taken Revolution Quad (four line) sport kites to a new level. At this point in time, there will be no more B-Pro Series Revolution kites (a joint venture between Bazzer, Barresi and Revolution) ... up till now, the standard in Revolution Kite flying. The patent has expired, as have the contracts that produced such works of art, that when in the right hands, can do amazing tricks in the sky and on the ground. Luckily, I have two B-Pro series kites. Enter the Phoenix Pro ... the next invention in kiting ... from Bazzer, who has since moved to Australia and married Jayne. 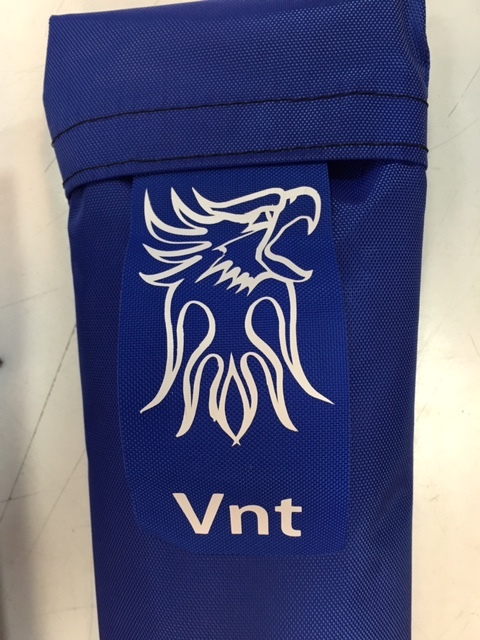 I ordered two of these beauties, a full sail (no vents) and a vented sail (two strips of mesh, making it possible to fly in stronger winds). Everyone waited patiently for their arrival except me. Thus began the saga of the kites. They were mailed in Australia on July 21. On the 23rd, they arrived in Los Angeles. True to the U. S. Post Office's amazing service, they sat there for 5 days. I called every phone number I could find, to no avail. Although I was going to have them mailed to me at the local UPS office, Jayne suggested they go to the Northwest Winds Kite Store in town. No problem, except everything I received from the Post Office had the UPS address. At long last I saw they made it to Seaside and were out for delivery. What I SHOULD have done was take a closer look at the mailing label Jayne sent to me. It said 10 Roosevelt Street. But wait .... NOT the UPS address and the KITE STORE address is 19 Roosevelt. About that time, I received an "undeliverable" text message. I dashed out the door, jumped in the car and RACED to the Post Office. Freaking out would be a good description. Worst case, the kites would be back at the station at the end of the day. I camped in their parking lot. SURPRISE!!! The nice Postman was familiar with the kite store, and dropped the kites off in spite of the wrong address. FINALLY I got my hot little hands on these beauties. Too bad I have a sliced finger and can't fly them!!! No worries, so far anyway. I'm down to bandaids, having caught the glue in my hair, resulting in a rather loud and hurtful ripping sound, followed by ... well I'm sure you can imagine. I stuck around the rig again, keeping a watchful eye on Jessie and contemplating my lovely foot tan until I couldn't stand it any more. I actually drove all the way to the drug store to get another box of bandaids. Sad, but true. DO NOT try to drive down Broadway Street (or any street for that matter) West towards the ocean. The streets are barely wide enough for two cars without parking on both sides, which there is. You will NOT fit and you'll make everyone else on that street really mad!! Park somewhere on Hwy 101 and walk. DO NOT go in the drug store with a brand spanking new baby (and I mean new) to buy baby bottles, formula and water so you can SIT in line at the checkout stand and prepare said bottle for baby on the FILTHY FLOOR with COLD WATER!!! Yes, giving that bottle to the baby did ease it's crying. I sincerely hope it survives the hotbed of germs it just ingested, not to mention anything that might have been in that unsterilized bottle. SHEESH!!!!! DO NOT just sit at those green lights. Green is for GO!! If the guy coming at you has his turn signal on .... GO GO GO. 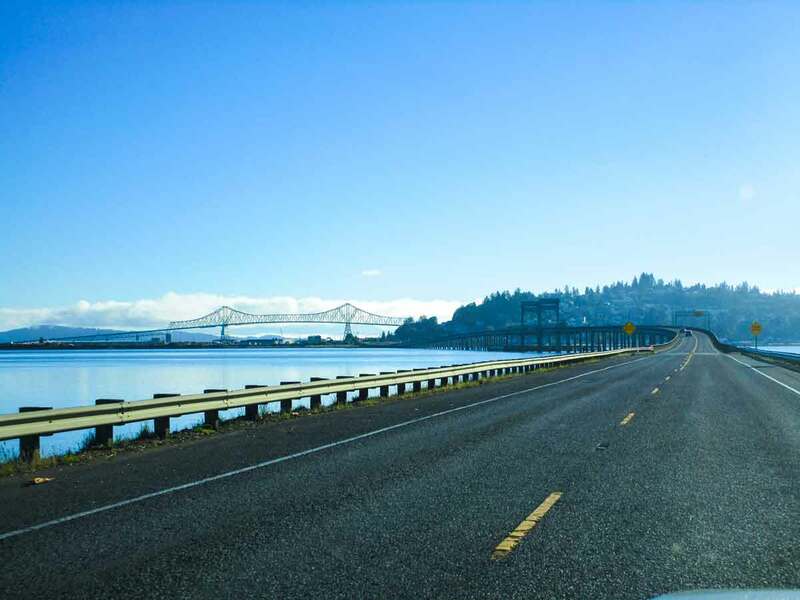 Don't sit and wait for every single car to disappear before you start your turn. I realize you don't care about the twenty cars behind you, but PLEASE use some common sense. Okay, that about does it for Seaside. Stay tuned for more DO NOTS from Long Beach!! Surviving that John Barresi Kite Clinic was a BIGGIE for us new fliers and this picture says it all. 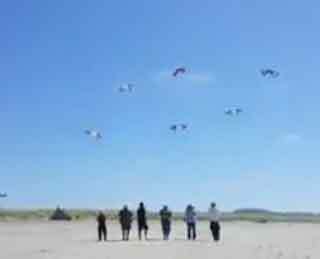 John is on the far right (top kite in our formation, the only straight one), calling out the moves we are to complete, with Ashley next to him (center right), then me (center left). Can you see those two little kids? That's Dylan (8) next to me in line and Cardin (6), the itty bitty third from the left. On the second day, those kids got drug around a little due to the wind. Heck, "I" got drug around!! I didn't last long Tuesday morning, thinking I was missing some good wind to fly in, so I sent Ashley a text message and we met on the beach. That's her mom in the chair, a smart cookie who brought her own seat. Since I was already flying, Ashley set up her new kite and we set about practicing what John preached. Why is it always easier said than done? After several downward figure eights, we came together for a quick picture before whacking leading edges. That's actually pretty good, considering where we both were three days ago!! Dani came to the beach with her Mama Ashley. She wasn't terribly thrilled, as you can tell. She's pretty sad her buddy passed away just a week ago and she wasn't eating. I suggested canned dog food, which she took to very well. With a full tummy, she slept most of the two hours we flew our kites. Ashley took a couple of pictures of me and my Shook. I think I've mentioned before, this is a piece of art, made by Eliot Shook from North Carolina. 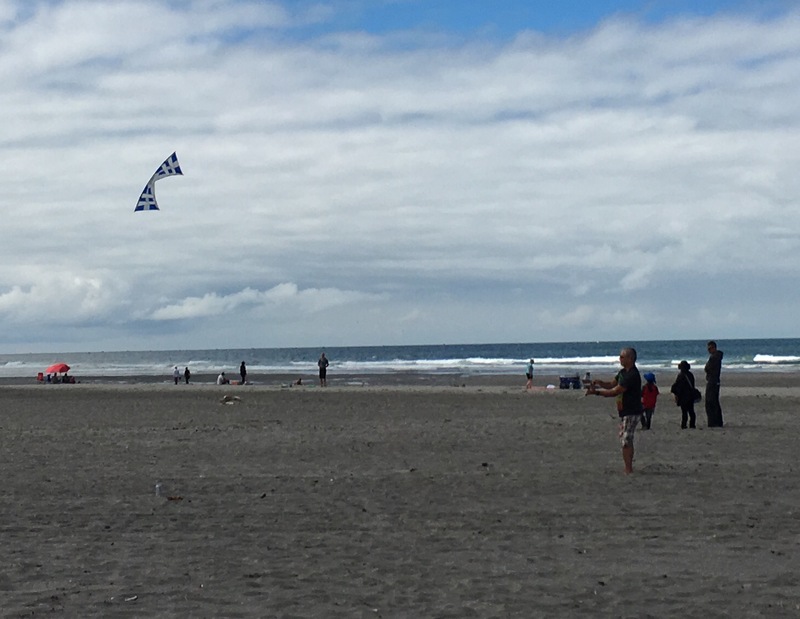 No two kites have the same design and most aren't even the same color. Amazingly, it finally clicked as I flew those figure eights. They said it's the difference between strangling a snake and holding a baby bird. I know, kiters are weird. For me, it was like driving a car and knowing how much to turn the wheel, how much brakes to apply and where the accelerator is. Now to practice and fine tune it so I can drive 65 mph one handed on cruise control!! Unfortunately due to my little accident and not flying for a few days, I'll probably forget everything I learned. I'm going to give it one more day before getting back on the beach. 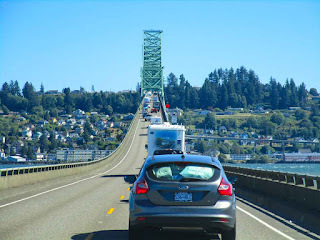 I'm driving up to Long Beach today to scout out a campsite. Since it worked out so well last time, I'm praying for a spot on the South side (satellite reception) and close to the beach. Say a little prayer for me too? Today I received emails from Tatiana, Odette, Dahlia, Camila, Celine and Kris. I'm pretty sure I don't want they are selling. Maybe if they picked names from some source other than "Most Popular Baby Names in 2005" (Mary and Diane might work), they could actually get someone to open their email. Guess where I'm at!! Not exactly where I wanted to spend my morning. Since the lasagna came out so well, I thought I might try for banana bread. BIG mistake!! That required chopping up the pineapple chunks that I picked up by mistake -- should have been crushed pineapple. I'm not sure who recommended the Ninja chopping machine, but it isn't a good idea for me to work with such high tech machines. Before I even got it out of the cabinet, it ripped my finger open from one side to the other. With blood running everywhere, I grabbed for a paper towel. You know, those BIG ones! After three, with no stoppage, I figured I better get myself to an Emergency Room. Luckily the neighbors were next door and knew right where the Hospital was. Note to self ... it would behoove me to check out the local emergency rooms everywhere I go, BEFORE something happens. Yes, I drove myself, with my right hand high in the air. I got lots of waves!!! The ER took me in immediately ... too much blood and all. Doc Chris was very nice as he unwound the paper towels, and took a look. He then explained how he was going to shove a needle into the base of this finger and move it around until it was numb. YIKES!!! Yes, he said it would hurt until it went numb, then he would sew it up. I almost passed out. He looked at it again, spreading it apart ... YOWZA ... and said maybe glue would work instead. I breathed a big sigh of relief. With half my finger glued from the front all around to the back, they finally got my blood pressure, which of course was through the roof!! I could feel every single beat in my finger!! They put on a splint so I wouldn't bend my knuckle and rip out the glue when I go kite flying. What? You thought I wouldn't fly? NO WAY!!! I'll just wrap it up with lots of bandaids. I'm pretty sure that tetanus shot I got will make up for no stitches in the pain department. When I got home, I messaged Nurse Patty for her expert advice. Her first question was did you cut the tendon. What?? TENDON? Nobody mentioned a tendon! I can still bend it ... does that count? Don't scare me like that!!! Apparently the infernal machine, out for blood, missed the tendon. Do you have any idea how often you use that ring finger? Good heavens!! It's even hard to drink a cup of coffee, let alone type. At least Miss Jessie has company in the "hurt digit" department. She's still doing good, not even limping, so I guess it doesn't hurt too bad. So much for cooking. Who knew it was so dangerous?? I'm back on Lean Cuisine and Taco Bell at least for the next week, and of course I have lasagna. Being handicapped now, I'm a little leery to try and use the oven. It better heal up quick ... I've got another Team Kite Flying Lesson in a week and I need that ring finger for control!!! My poor Jessie girl was shaking like a leaf when I dropped her off yesterday morning for leg surgery. She was so scared, she paid no attention to the kitty next to her on the couch. I again mentioned the "cone" issues as they took her away. Sniff sniff!! I figured it would be a hang-around day while I waited, so I headed to the store for lasagna supplies. Unfortunately, I left Miss Terry's Cookbook at home. RATS!! So I winged it ... dangerous territory for me!! I had already scoped out a burial zone, just in case. At 2:00 I ran back to pick up my girl, cone and all. They removed the lump, but couldn't tell what it was. Just to be safe, I had them send it out for biopsy. Instead of going ballistic with the cone this time, she froze. Those little feet just wouldn't move an inch. I carried her to the car and to the rig, depositing her on the couch. Still frozen 15 minutes later, I removed the cone, fed the starving baby and carried her outside. Once back in her spot, she wasn't a happy camper AT ALL. She growled if I even looked at her. Cooper didn't get any favors either. Meanwhile, I made a mess of my kitchen, just for kicks. Do you know how hard it is to make lasagna in such a small space?? Note to self ... get a bigger pan so you don't have to cook three noodles at a time. Don't worry about that cheese on the floor, Cooper will get it. An hour later, I had three beautiful pans of lasagna. Two went in the freezer, one in the oven. At the exact moment it came OUT of the oven, I remembered I had Miss Terry's book on my phone. Well DOUBLE RATS!! I could have had the REAL thing ... instead, I got the winged version. Still, it's pretty tasty. Could my cooking possibly be getting better??? While at the store, I was VERY surprised to find someone had made chocolate cream pie for me. How nice was THAT?? Miniature versions ... perfect for lunch AND dinner. No really, I had half of it for lunch and saved the rest for dinner's dessert. In the afternoon while Jessie slept, I took Cooper out to play catch with his ball. Surprisingly, he hasn't picked up Jessie's dog hating habits and actually played with three kids and their Havanese. They were so excited when he rolled the ball to them with his nose so they could roll it back. Little did they know they were stuck doing that for the next hour. Miss Jessie slept late into the night on the couch. I figured it would be a little difficult with the cone under the bed covers where she sleeps, so I left it off. She was a good girl ... I only had to holler at her once to stop licking her leg. This morning she went up and down the steps on her own and doesn't seem to be having any problems. Doesn't she look like a little angel? HA!!!! I probably won't stray too far from the rig again today, just to be sure she leaves her leg alone. I'm already in kite withdrawal!! All tolled, Miss Jessie is about a $2,300 dog after being fixed, repair of a broken foot, stitching up a torn shoulder and teeth cleaning, now including leg surgery. Hopefully in her old age she will slow down a little!!! I won't hold my breath. This morning Miss Jessie has an appointment with the Vet in Seaside to remove a tumor from her hind leg, so I'm basically skipping the blog for today. I'm sure she'll be fine ... it's basically minor surgery. The problems will come when they try to put that cone on her head to keep her from bothering the sutures. The worst part, is she (and therefore Cooper) can't eat this morning. Jessie is driving me nuts, jumping up and down wondering where breakfast is. It's only 5:30 and a long way to the 8:00 appointment. I guess we'll go for a long walk to keep her occupied and not barking, waking up the neighbors!! I should have her back by 3:00 this afternoon and I'll let you know how she's doing. It Was A Froggy Day!! Not the ribbit kind of froggy, but the misty, can't see, no wind type of froggy day. Not that I was really feeling like spending another full day at the beach, but surprisingly, I wasn't sore or hurting from sunburn, I was just TIRED!! A GOOD kind of tired. On the other hand, maybe it was from no sleep as my brain kept wrapping itself around each and every maneuver while my hands waved wildly in the air. 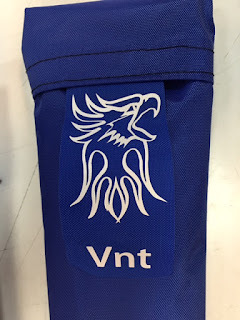 In all the conversations with John Barresi about kites, I was lacking in a few accessories, so yesterday was the perfect time to hit Northwest Winds Kite Store in Seaside. 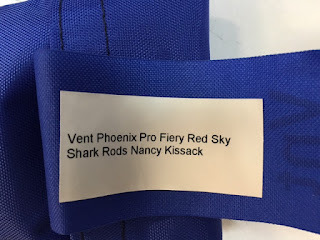 If you need anything kite or wind sock related, stop in for a look see. They are full to the brim of everything kite and FUN, even those little flags you hang outside your door. They also happen to be right next door to the Tsunami Sandwich shop, and what a coincidence, I got there at 11:30 ... just in time for lunch. This is a Stormwatcher ... thin sliced turkey, Tillamook cheddar, tomato and bacon grilled to perfection!! Throw in chips and never-ending soda for $11. Then I hit up Ted in the kite shop for some extra spars ... not that I've had any break, but different winds require different framework for the kites. 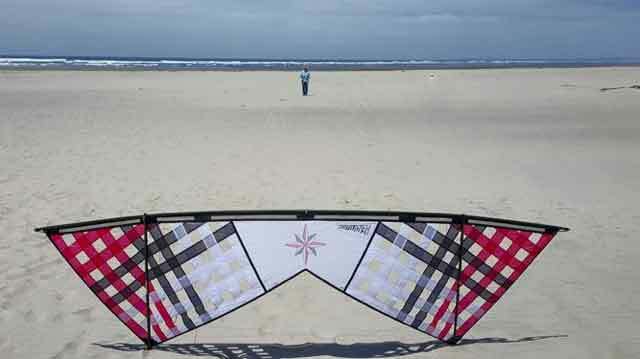 The second day I only had very heavy 4-wraps for my kite, making it much heavier and harder to fly. That's my excuse and I'm sticking to it!! I bought up practically everything Ted had left in the store ... Terry Rowley, another GREAT (really really good) Team Flyer beat me to the punch. It looks like a lot, but there's only two sets here. You noticed the ice cream? Well it just happens there is a secret place to park if you're heading downtown, which is strategically placed next to Sea Star Gelato. This is actually two scoops, so you can mix and match!! YUM YUM!! This is another "hint" about where the parking is, usually still available by 11:00 am. As with all Oregon businesses, their flowers are spectacular!! Oh gosh ... 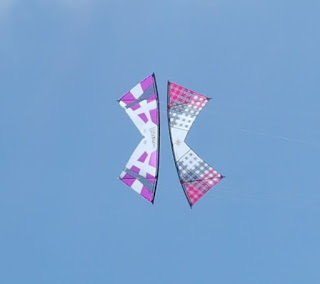 I forgot to mention that Extra Vent B-Pro series kite I'm picking up, hopefully the end of this week!! I sure could have used it LAST weekend!! It just happens to match my red and black colors and fills out my kite selection. With my belly full, my sweet tooth satisfied and my kite addiction calmed for the moment, I headed back home through the misty fog. Not fifteen minutes later, I couldn't stand it. I gathered up my kite bag and headed to the beach. Not that I expected to be able to fly, but you never know. I walked all the way out to find not a breath of air. Some people can still fly in that condition, but I'm not one of them. No worries, there will be lots more days to fly. Tomorrow is Jessie's surgery on her hock for a one inch growth that has to be removed. It's not a full blown knock her out kind ... they will just use a local. The problem will be trying to keep her from messing with it. I tried a collar once before and she went ballistic ... literally ripping it and her to shreds. It may mean I put the kites on hold for a few days. Flying More Than High ... I'm In The Clouds!! Another early start to a second amazing day of Revolution Team Kite flying. It's so early there's NO ONE on the highway ... 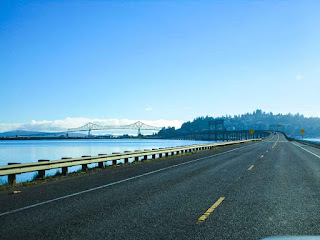 I breezed right along through Astoria and across the bridge, arriving at 8:00 am. Plenty of time for a parking spot. Thankfully, two mothers took videos of us flying, otherwise I'd have nothing to show you. We were flying almost every minute of the day ... and believe me, it was a WORKOUT! The winds came up to around 20 mph according to my weather app, whipping sand everywhere. Being a bunch of diehards, we flew regardless!! That's John on the right, I'm second, and from there I have no idea. 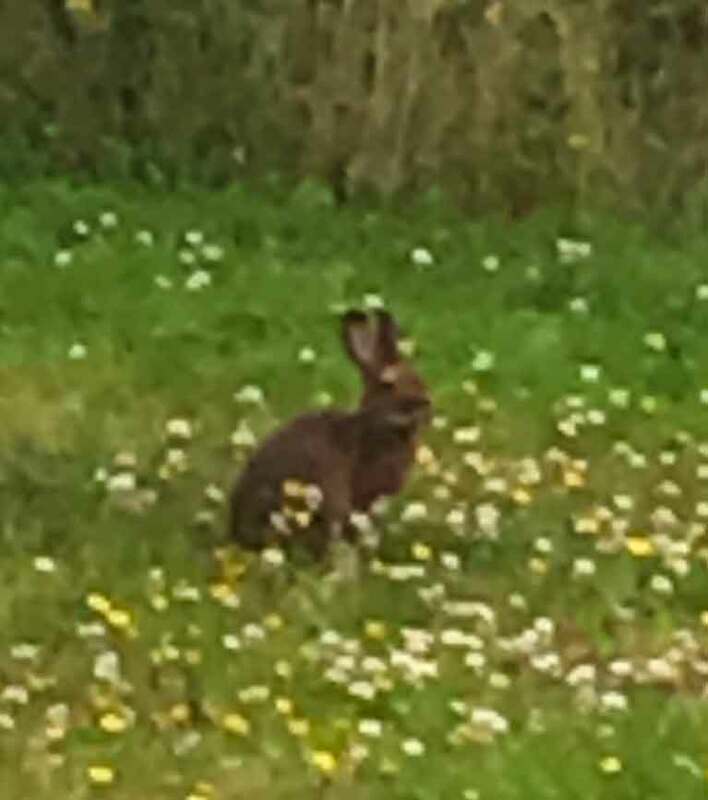 I snipped this image from a video posted online, so it's not too clear. I do know the far left is the 8 years old. MAN that kid can fly!! This is threading the needle?? Forgive me, I don't remember all the names of what we did. My head was stuffed so full of information on how to get my kite to do what I wanted, there was no room left for names of any kind!! At any rate, odd numbers went up, then as they came down, even numbers went up through the holes. I think we managed this three times in a row!! Double arch ... I do remember this one. Same as above, John on the far right, top arch, me second from the right top arch. From here, we would all burst OUT of the arch trying to keep our same positions, then fly backwards to this position, repeat, then to a straight line, then land together. With so much wind, no matter how much I adjusted my lines, every time we went UP, it drug me a few feet forward. My arms now feel like they are going to fall off. On my right is Mark who has been flying for many years and knows all the routines. He helped me out a lot!! This is John and Mark flying a dog stake. They wrap their lines around a stake and fly the kite over their heads. There's no way I'm trying THAT!! Just look at these poor kids trying to hang on! That was me .... I should have some really great shoulder and back muscles now!! We did more boxes and triangles, before finally trying the figure eight. Here's how this works ... or at least SHOULD work. 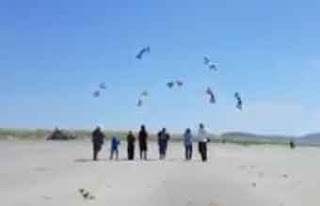 Sorry I don't have pictures of this, but you would only have seen a big jumble of twisted kites!! Everyone goes up ... John starts by making a right hand turn, flying down, then around and up to the top left. I follow ... sort of ... winding my line under everyone else. Each one follows, making a tangled mess in the middle. John now turns left, flies down and around, ending up in his first position with me and everyone else following. As you can imagine, that didn't work so well the first eight times we tried it!! Mostly because two of us had never even done that maneuver before by ourselves!! Finally, on the last try, I got it right and came out unscathed. The last four crashed and burned, so we went on to easier things. 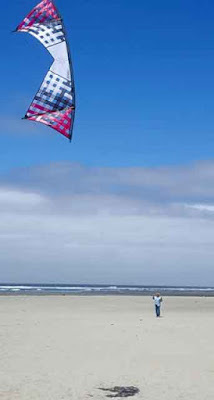 If you've never tried flying this type of kite and are up for a little challenge, you should give it a shot. It's great exercise, not to mention being on the beach all day. My advice is to take a chair with you, because you're going to love it and won't want to leave. Trust me, after a couple of hours, you're going to want to sit!! I can't thank Joanna enough for letting me know about this clinic. It was the most fun I've had in ages, even with all the sand I swallowed, my burned feet and sore shoulders. To make it even better, I asked John to show me Joanna's secret to her magic fingers AND HE DID!! Not that I can do it, but maybe with another 100 hours of practice!! I drove home with my head in the clouds. I even had extra time to contemplate all my new knowledge as the bridge was backed up for two miles on each side. Seems a truck conked out right in the middle of the UP section. I spent 30 minutes on that bridge, hoping THE BIG ONE didn't hit and throw me in the water!! I slept pretty good, but this morning noticed my arms almost reach the floor. If I need anything on the top shelf today, I won't need a step stool. I'm thinking aspirin and the couch should fix me up just fine!! Short and sweet ... we flew as an eight man team and I'm totally BEAT and extra crispy!! After an hour's drive, I arrived at the designated meeting point in Long Beach, with of course no sleep and a sick stomach from nerves. When I saw John in the parking lot, he reassured me there was one other gal who had basically NO experience, so I didn't feel quite so bad. What DID make me feel bad was the two tiny kids I saw buy their first kite just last year. They were also in the group (6 and 8 yrs old), flying almost as good as John. We all set up our kites rather far apart and he went from kite to kite, checking setups and flying each one before tweeking it to perfection. 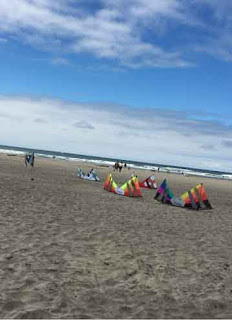 He then gave us some drills to do as he worked on everyone else's kites. Sorry, there's not much in the way of pictures. There just wasn't time. I flew up and then upside down, turned and landed until I was doing much better. Our first break wasn't a break at all, but an encyclopedia of information about kites, how they are made and how they fly. GREAT info!! From there, we all lined up in a row about 10 feet apart with John on the end. He would do a maneuver, then land. Next in line did the same thing, and on down the line. 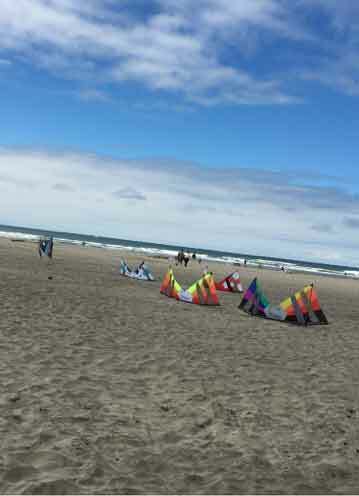 Pretty soon, odd numbers did the maneuver while even numbers kept their kites planted in the sand. 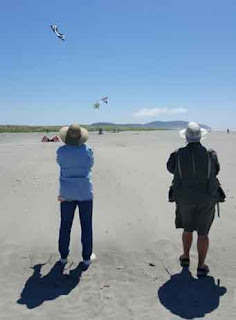 In no time, we were threading the needle with our kites coming down while the two next to us went up. Next maneuver was making a box with four kites and landing, then a diamond and finally a circle. Once in a circle, we would burst OUT (making it much bigger), then fly backwards to the inside, then into a long line and finally landing. You just can't imagine how cool that was unless you were flying. I was in total shock that I was able to do everything ... maybe not perfectly, but at least I didn't crash into anyone. I not only took Advil when I got home, but Advil PM to sleep and slathered my feet in Aloe. Bedtime was 8:30!! So I'm off again early this morning, a little worse for wear, in order to get a parking spot for another day of team flying. Hopefully it goes as good as the first day, cuz it was a real KICK IN THE PANTS!!! That probably doesn't surprise you, but it sure gave me a shock!! I got an email from Magic Fingers Joanna that John Barresi was giving a Team Flying class this weekend. I laughed ... because I know how I am about those kinds of things .... scared to death!! 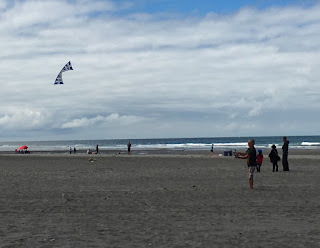 I pondered and pondered, finally logging back on to Kite Life. It said Beginning Team Flying, so I thought what the heck ..... 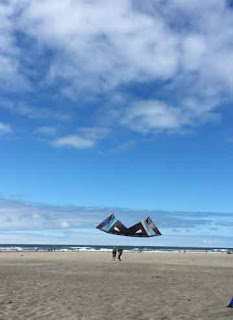 I'll sign up to go fly my Revolution kite with the best in the world, even though I can hardly keep it from crashing!! What could go wrong, right? My registration actually says "Beginner ... up and down, some control, bumps and crashes". I immediately got sick to my stomach. What was I thinking??? I fly with 80 foot lines that usually come with the kites. The class said 120 foot lines required. I knew I had some, but they had never left the bag. I figured I better get out and at least set them up once to get them untangled. Boy ... that's a L O N G way out there. 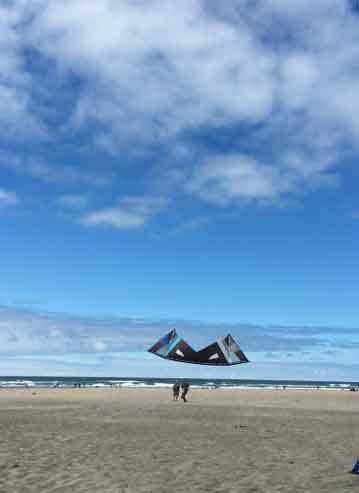 After 30 minutes of getting them unwound and straight, I pulled the kite into the air. WOW!!! WHAT a difference!!! At least in this wind, those longer lines made it easier to control ... easier than it WAS anyway. Two hours later, my back was aching and my shoulders hard as a rock. That's when I noticed this really black cloud coming my direction. Time to go!! The nervous nelly sick stomach comes and goes, this morning worse than ever. Here's hoping I don't make a complete fool of myself!! Back at the rig, I went straight for the wine bottle to settle my nerves. The freezer drawer refused to close. I slammed it a little harder. Nothing. 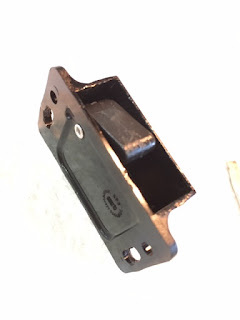 I finally crawled underneath and removed this latch at the bottom of the big drawer. This is it with the little piece in the middle, in the up position. This is the same piece in the down position. No matter how I moved it, nothing worked. 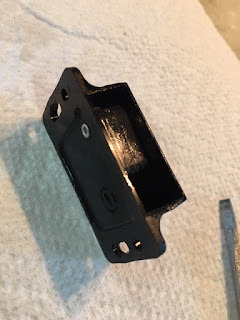 This is the black piece that it should lock into .... but it doesn't, nor can I get the latch hooked on to this piece. Anyone out there have any ideas?? The freezer door stays shut, but I imagine the first corner I take too fast will have it slamming open, breaking something. I appreciate anyone's help!! So I'm off early this morning for the hour's drive to Long Beach for this class. Worse case, I'll get sick and come home, but I'm really hoping I learn some cool moves so I can fly better, without all those crashes!!! Remember that cute little succulent I've been carrying around for almost two years? I picked it up in Tucson and babied it until it finally bloomed. Then it got a little overheated and the tips died, but Miss Patty the Gardener said to just wait ... it would return. Just as she said, it began to grow again in the middle, but leaving it in the warm RV was a death sentence. Turns out leaving it OUTSIDE was also a death sentence. Those darn little bunnies running all over the park have taken up residency under my rig and had my poor little plant for breakfast. AAHHHGGG!!! Those little stinkers!!! They only come out in the early mornings, so it's hard to get a good picture. When you have two dogs who have tied your legs with their leashes, trying to EAT the bunnies, while I try to focus my iPhone and press the button with one hand was difficult at best. I'm pretty sure the little plant won't survive THIS!!! At least they didn't like the cactus or the bonsai!! Since I was out of all things sweet, I headed off to Pacific Way Bakery in Gearhart, just down the street. You can't miss it ... it's the one with all the people standing out front waiting to get in the door. Go early, because by 7:30 when I got there, most of the GOOD goodies were gone. They still had some excellent sweets left however. That's a peach filled puff pastry and yes ... a chocolate croissant!!! I ate the whole thing! Not both, just the croissant, which as you can see, is half the size of a large paper plate!! After a little TV and puppy play, I emptied the tanks and began the laundry, settling in for a day of drudgery!! There were a few breaks of watching campers coming in and setting up brand new tents, as well as the family with the rented RV who didn't know how to hook up the sewer. I wandered by just in time to prevent a disaster. By now I have clothes hung up from one end of my rig to the other. I hang dry most of my stuff since everything seems to be made of cotton nowadays. Two minutes in the dryer and they become washrags! Since fairy gardens are all the rage, I spotted these two cute pieces and had to have them. I should have put the gazebo over my plant ... it might have saved the day. 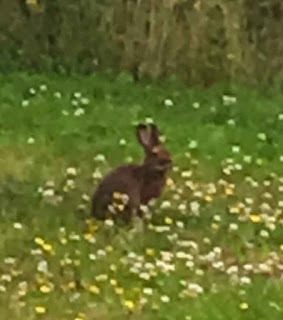 While wandering over to the parking lot where Jessie could see the bunnies ... you can imagine how THAT turned out ... I spotted this rig for sale. Sadly, it's a Divorce Sale. This 2007 Ambassador with new tires and all the maintenance records is selling for $110,000 AND you get the 2003 Jeep thrown in for free. With only 30,000 miles and all new batteries, it sounds like a good deal. Course I can't see inside, but it looks to be in immaculate shape. I didn't see any dings at all. So if you or anyone you know is interested, give Scott a call. With the laundry finally done, I settled on a new recipe for dinner, chicken spaghetti. As most of you know, cooking something that requires a lot of room in a very small RV kitchen, isn't easy. I tried to cut and hack everything before I started, which worked out just fine. It was when I tried to open the stove cover that things went south. The pan of water for the spaghetti was just a tiny bit too close. In spite of my best efforts, it hit the floor before I saw what was happening. Although Cooper and Jessie came to help me ... I think more scared from the noise than the desire to help ... it took me thirty minutes to clean up all the water on the floor. At least it wasn't HOT water. How could I not laugh when I saw this face?? All cleaned up, I continued undaunted and came up with a great tasting casserole with minimal ingredients ... perfect for a potluck. Just look up Pioneer Woman Chicken Spaghetti for the recipe. I cheated and used roasted chicken from the grocery store. More overcast ... actually, I think it was fog yesterday ... no wind and more rain this morning. I'm hoping for wind and kite flying today, but won't hold my breath. If not, maybe a ride down the Promenade on my bike will be in order. No Wind But Lots Of Laughs!! I'm Flying Long And HIGH!!! Big Storm On The Coast!! I Survived Hwy 20 By The Skin Of My Teeth!!! Hot Lake Hotel Is HOT! !